Our goal is to create a modern website that is easy to use on many types of devices. The site includes a responsive layout that adjusts to large screens, tablets and phones. We have used full screen images where possible that show off our work to it’s best. The navigation is kept simple and search features have been added to help you find content. Users of our previous website will find similarities in the structure of the previous website. We still have Practice, Projects and News but we have moved Contact into a more prominent position on the main menu so that you can easily contact us. Under Practice, similar to the previous website, we have included information about People, Awards, Policies, Testimonials, Alumnni and Heritage but we think you will find the information easier to navigate. Our primary Expertise is Architecture, Interior Design and Urban Design & Planning but we also have significant expertise in complementary areas which include BIM, Sustainability, Conservation and Art in Architecture. Projects can now be browsed by Expertise which includes images and text carefully selected for each Expertise. Projects are still grouped by Sector but we have also included the ability to search for projects by text or by map which are both very useful features for all users including our staff. Projects can now be easily filtered by Sector and searched using plain text searches. Each project page includes a brief introduction to the project along with key data and content which is based on the particular expertise used on the project. Where applicable, new content on the page is tailored to the project. Our News section now looks and feels like a sophisticated blog site where articles are cross referenced with projects and authors and tags are used to relate articles with similar content. It is now easy to share articles as there are buttons on the top of the page which allow users to share articles via LinkedIn, Twitter, Facebook or email. As new articles are added, we will publish them on WordPress, LinkedIn, Twitter and Facebook. 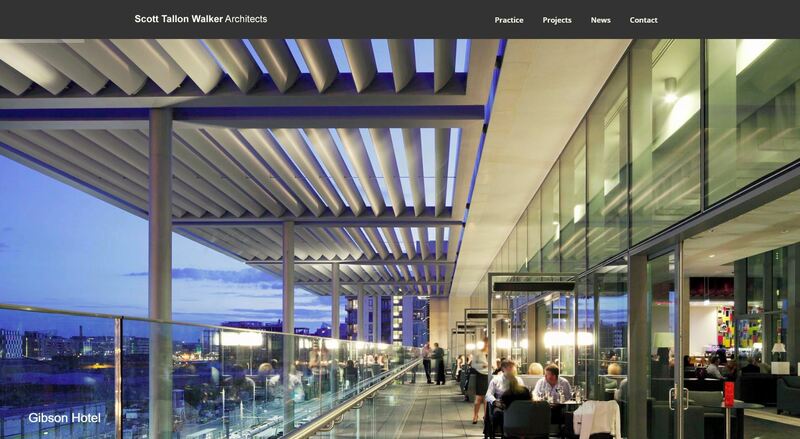 The site was designed and built by Scott Tallon Walker Architects as an extension to our web based project management systems which provides us the benefit of having a single source of information that reflects the way we work and enables us to scale the website and content easily. We hope you enjoy our new website. If you wish to receive notifications about our news articles, please subscribe to our newsletter. We promise not to fill up you inbox as we collate our news articles and issue an update just twice a year. This entry was posted in Announcements and tagged website on June 29, 2018 by stwarchitects.